Ephebopus cyanognathus West & Marshall, 2000, also known as “blue fang skeleton tarantula” (often abbreviated as “blue fang”), is a very remarkable bird spider due to its coloration and behavior from French Guiana. However she’s named after her wonderful blue chelicerae, the overall coloration is incredible, esp. on spiderlings. She’s very similar to Ephebopus uatuman, but the species is different in the coloration of the female, esp. the metallic blue chelicerae, and the shape of the genitalia in both sexes. Ephebopus cyanognathus is considered to be a classic burrower, creating enlarged chambers underneath a classic entrance covered in leaf litter. The genus, however, belongs to the subfamily of the Aviculariinae, which mostly consists arboreal bird spiders. Spiderlings from the genus have been observed living semi-arboreal. In march 1999 an Ephebopus cyanognathus was found in a retreat constructed of dead leaf in a plant in the Chevaux Mountains. The retreat had no obvious entrance and was about 20cm above the ground (source). Contrary to other new world tarantulas, urticating setae of Ephebopus spp. occupy a small field of 1–2 square mm on the medial side of the palpal femora. This is rather uncommon. Common names: Blue fang skeleton tarantula. Blue fang. Urticating setae: Yes (pedipalps, femura). Origin: French Guiana (Roura, Tresor reserve (read more), Kourou, Móntsinery, Montagne des chevaux, but in Saül and Maripasoula on the other side of the country as well). To have an idea of what the habitat looks like, watch this video. Body length: ≤ 4/5cm. Ephebopus cyanognathus is sexually dimorphic, with females being a little bit larger and heavier than males. The first leg pair on males is longer than females. Behavior: Ephebopus cyanognathus is very nervous, defensive and (at younger ages) as fast as lightning. The spider will try to flee at first. Persistent provocation can result in the use of urticating setae or a bite. The spider will dig a burrow underground, not as deep as other burrowing species, fortifying the entrance with whatever she can find a few centimeters above the surface (video). Ephebopus cyanognathus must be given the oppotunity to burrow and climb, esp. at younger ages, due to the fact they might show a semi-arboreal lifestyle. Life expectancy: Females probably become up to 12-15 years old. Males are given a shorter lifetime of 3-4 years. No valuable source found. Ephebopus cyanognathus lives widely distributed in upland rainforest areas (source). Both temperatures and humidity are fairly constant throughout the year, with a short dry season in September and October. Temperatures almost daily reach levels up to 30°C, but keeping in mind that the species is mostly found on north-facing slopes, she is obviously trying to escape from the heat. Ephebopus cyanognathus will make flare-mouthed tubular burrows covered in leaf litter. Adult females were often found in enlarged chambers up to 30cm deep. Do not overheat the terrarium. Take a look at this video to see an Ephebopus cyanognathus and her burrow in her natural habitat. Temperature: 21-25°C (day), 19-21°C (night). Humidity: 75-90%. In september and october local temperatures are rather hot, with a significant drop of humidity to 60-70%. Adult: LxWxH: 30x30x40. At least 3x span width in height. Smaller than adult: 3x span width in height. * Provide woodland at the surface, with safe height. Adult: Min. 2x span width. Smaller than adult: Min. 1x span width. * The spider lives in rainforests. She’ll fortify the entrance of her burrow with leaves and branches. * Throughout the year the spider lives in moist area. Note that cages with high humidity levels are very sensitive for mites. Please take your precautions. Wet season: January, february, march, april, may, june, july, november, december. Mating the Ephebopus-genus normally runs smoothly. Male and female are sometimes kept together for 2 weeks. After introducing the male, the spiders will take quiet a long time feeling each other. When copulation is done, the female will retreat in her burrow, probably not attacking the male. Introduce the male more than once, every 2 days, or leave them together up to 2 weeks. In this last scenario cannibalism may occur. • Provide hiding places for the male when you decide to leave them together. • Don’t change environmental factors for 1-2 months after mating. Make humidity drop (and substrate semi-dry out) for 1-2 months afterwards. Stabalize temperatures throughout the whole process. • From the moment you moist the substrate close to the spiders hole 3-5 months after mating, you’ll trigger the female to start making the cocoon. Deprive the cocoon, when desired, 3-4 weeks later. Store the eggs at a humidity of 80-90% and a temperature of 25-29°C. Expect 50-150 spiderlings to come out.  • It’s not unusual that spiders of the Ephebopus-genus create a second cocoon a few months after the first one (Hooijer/2002). The amount of fertilized eggs will probably be less than the first cocoon. • Spiderlings can be kept communal for a few months. Provide a correct amount of food in order to prevent cannibalism. Seperate them after 2-3 months. • “cyanognathus” stands for blue (cyano) jaws (gnathus)? • Chelicerae of adult females and immature species of both sexes are blue, where chelicerae of a mature male are rosy/purple? • Urticating setae of Ephebopus spp. occupy a small field of 1–2 square mm on the medial side of the palpal femora? This is very uncommon. • Ephebopus uatuman, Ephebopus cyanognathus and Ephebopus foliatus share the presence of yellow rings on the legs? • Spiderlings are incredibly beautiful? Click on the photo. For more information sheets, click here. • Review and clasistic analysis of the Neotropical tarantula genus Ephebopus Simon 1892 (Araneae: Theraphosidae) with notes on the Aviculariinae. • Palpal urticating hairs in the genus Ephebopus: fine structure and mechanism of release. 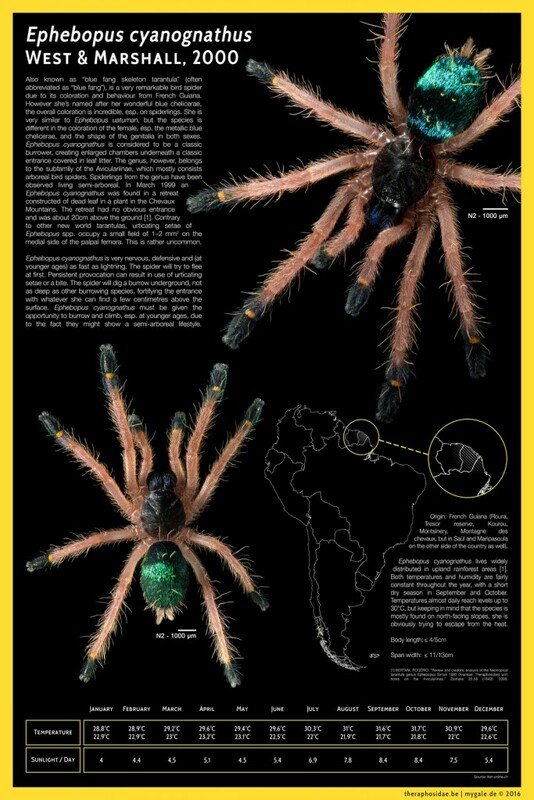 • The Brazilian species of the spider genus Ephebopus Simon 1892 with description of E. uatunam n. sp. • The genus Ephebopus Simon 1892. Description of the male of Ephebopus murinus (Walckenaer), 1837. • Structural color and its interaction with other color-producing elements. Perspectives from spiders. • Structural colors in spiders. 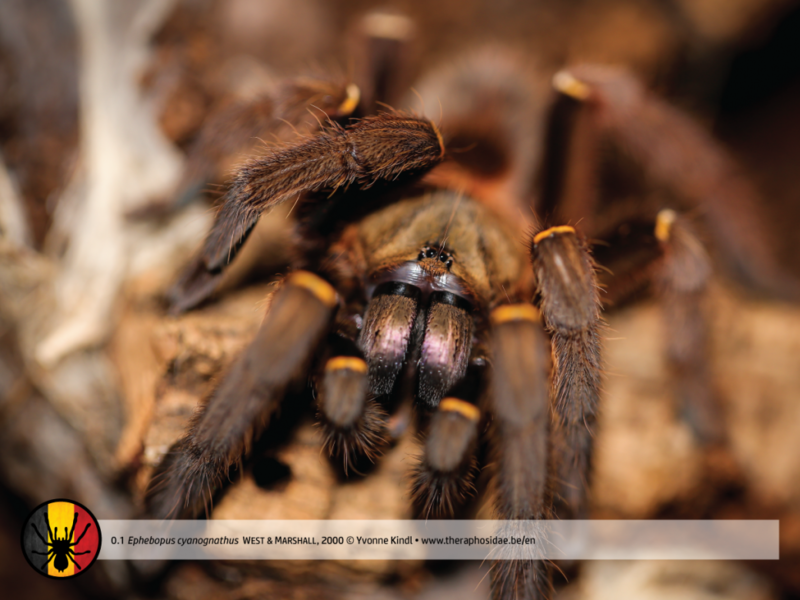 • Blue reflectance in tarantulas is evolutionaly conserved despite nanostructural diversity.